When a tooth is damaged due to injury, trauma, or decay, fillings are often the best way to restore the tooth’s natural structure. Dr. Bennett and his team proudly provide enamel-colored composite fillings for rebuilding teeth discreetly and sealing off cavities effectively once we have removed the decay from your smile. The white composite materials we use molds to the shape of your tooth, and the shade we choose helps your filling blend seamlessly with your surrounding teeth. How Will I Know When I Need a Filling? If you’re experiencing any kind of tooth pain, discomfort, or sensitivity, chances are you may need a filling. 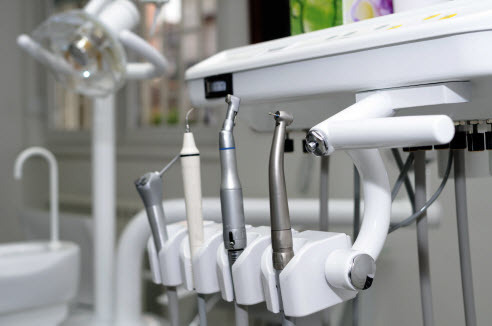 Our dentist can detect whether you have a cavity that needs to be filled. During your exam, we evaluate the status of your tooth and anything that looks out-of-the-ordinary will be looked at further. We may obtain an entire image of your mouth using x-ray technology to get a closer look at the tooth in question and decide if a filling is the best course of action for your smile. If it’s determined there’s more extensive damage to your tooth, you may need a crown to restore it properly. Crowns are fixed restorations designed to restore a damaged tooth to its original shape, size, look, and feel. They’re permanently cemented on teeth that have cracked, extensively decayed, or otherwise been damaged. Although they sometimes can extend down to the root, crowns fundamentally replace the outer structure of the “crown” or biting surface of a natural tooth. When placed, crowns completely encase the portion of the damaged tooth that sits above the gum line. Crowns are custom-made to fit over each tooth, making them a favorable and reliable treatment. Part of the reason why crowns are so popular is their versatility. Crowns are used to address, correct, and finalize many other treatments. Damage & Wear- Chips, cracks, or fractures can expose the soft inner dental tissues to infection. When repaired with a crown, dental function, health, and beauty are restored. 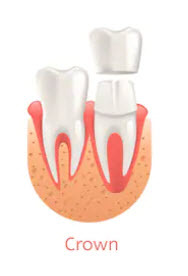 Root Canal Therapy- When infection is removed from the root, crowns are used to seal off and protect the tooth structure. With a customized crown, your tooth can function normally and look natural. Dental Implants- For patients in need of single tooth replacement, an implant-supported crown restores a missing tooth completely. Crowns restore the strength, functionality, and appearance of a damaged tooth. After placement, you’ll be able to chew once again without risking further damage. Crowns protect the vulnerable part of the tooth by physically holding it together and shielding it from damage, wear, or infection. Restorative dental services will help you regain oral health without compromising aesthetic goals. If you are experiencing tooth pain or have missing teeth, schedule an appointment with the professionals at Lake Dental Care today!